This latest version of the Groove radio now comes with 802.11ac support and a gigabit ethernet port to make use of the high ac wireless speeds. The radio can broadcast on either 2.4Ghz or 5GHz frequencies, with up to 80Mhz channel bandwidth on the 5ghz channel. Support for legacy wireless modes is also included. The LED signal indicators on the device allow for easy alignment and the built-in N-male connector and pole mount attachment points mean it can be attached to an antenna directly or used with a standard antenna cable. Box contains: Groove unit, mounting loops, PoE injector, power adapter, 6/8dBi 2.4/5GHz Omni antenna. 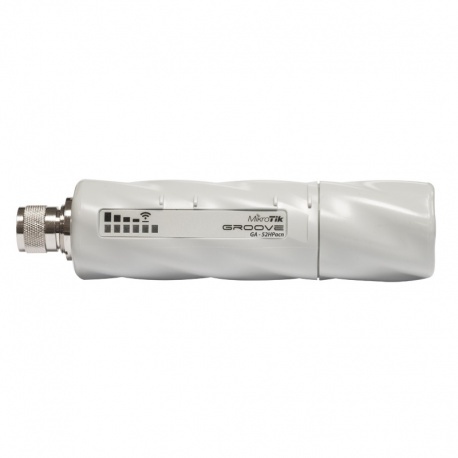 The GrooveA 52 ac is Mikrotik's smallest outdoor series model. It is a weatherproof, durable and fully-featured wireless RouterBoard powered by Mikrotik's proprietary RouterOS software.